"Death Wish At 120 Decibels!" Grant Page is our personal hero. An Australian stuntman known for his unbelievably dangerous stunt work, here he gets his own movie so he can display his charm to the audience as well. Director Brian Trenchard-Smith fashioned an innovative cross between a documentary, a fictional film and a concert film, and its ahead-of-its-time (even today) nature ensures pure entertainment that will appeal to any generation. What’s so cool about Stunt Rock, besides the stunts and music, is that the filmmakers were smart enough not to weigh it down with an involved plot. There’s really no time for that, it has to be packed full with stunts and the music of the L.A. rock band Sorcery. What happens is, Grant comes to Los Angeles to work on a new TV show starring Monique van de Ven, called Undercover Girl. Interestingly, her smarmy agent is played by Richard Blackburn, the director of the great Lemora: A Child’s Tale of the Supernatural (1973). The director of the show is played by Ron Raley, whose student film at UCLA was photographed by none other than Jim Morrison of The Doors fame when Morrison, Raley and Blackburn were at UCLA film school together. A very early appearance by Phil Hartman as the assistant director passes in a flash. Anyway, Grant ends up in a relationship with a magazine reporter (Margaret Gerard, wife of Trenchard-Smith) who is doing an article on stunt men. Meanwhile, Grant’s cousin is in the stage show for Sorcery, who re-enact cosmic battles between good and evil featuring wizards and demons while the band crank out their rockin’ tunes. This hugely entertaining film is just too awesome for words. 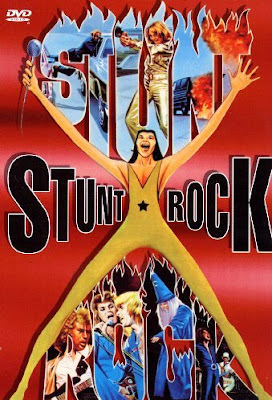 The great Trenchard-Smith blasted out a tour-de-force of music and action - a majority of the movie is footage of Page’s death-defying stunts while Sorcery music blares on the soundtrack. Page’s insane, awe-inspiring work is so eye-popping, Trenchard-Smith puts it on split screens because one screen just isn’t enough! 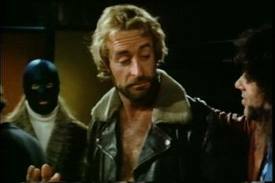 The movie also has plenty of humor, as evidenced by the masked keyboard player with the funny voice (Doug Loch). 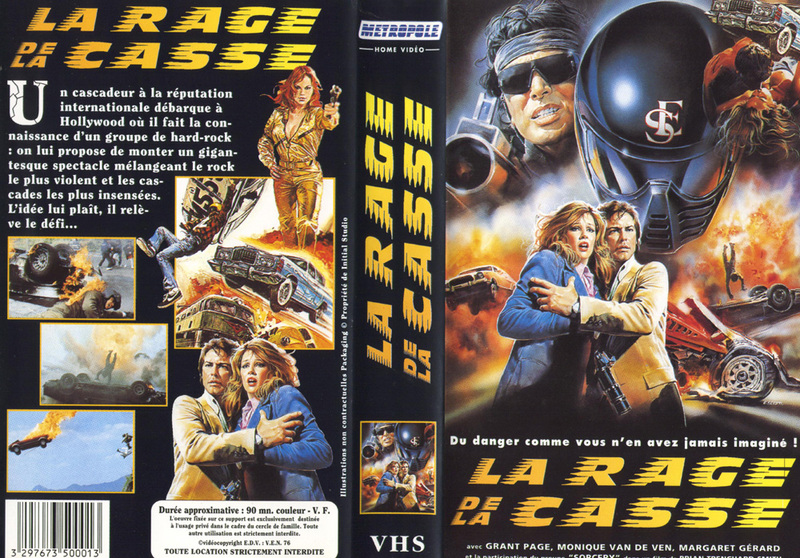 Pure fun, the simplicity of the execution, married with the powerful combination of the music and the action, guarantees Stunt Rock the status of cinematic masterpiece. 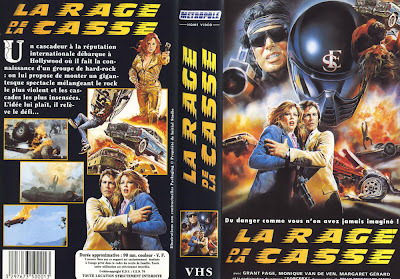 Trenchard-Smith described this gem as “a love letter to stuntmen in general and Grant Page in particular”, and that love comes through in spades, and the overall upbeat, positive vibe is totally winning. Much of that has to do with the presence, music and magic tricks of Sorcery. 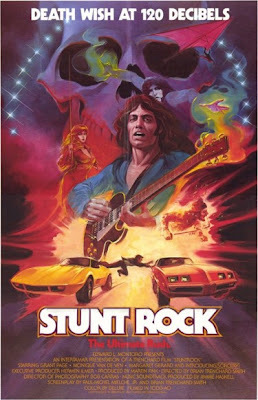 If the filmmakers had gone with Foreigner or Van Halen (two other potential choices), it just would not have been the same, and Stunt Rock would have been an entirely different experience. If you don’t like Stunt Rock, please seek psychiatric help immediately. You are a danger to the community. NOTE: A lot of the information in this review came from the excellent Code Red 2-DVD set. Buy it right now. I don't think I've seen a 4 star review here yet Ty, so I think I better heed your words and check this bad boy out. Split screen action? Fantastic. This definitely looks like a lot of fun. I'll have to check it out at some point. It is definitely worth-watching! Grant Page does some amazing stunts in this!